Greg Scown is the co-founder of Smile Software. Smile specializes in making productivity tools that save time and make your digital life easier. 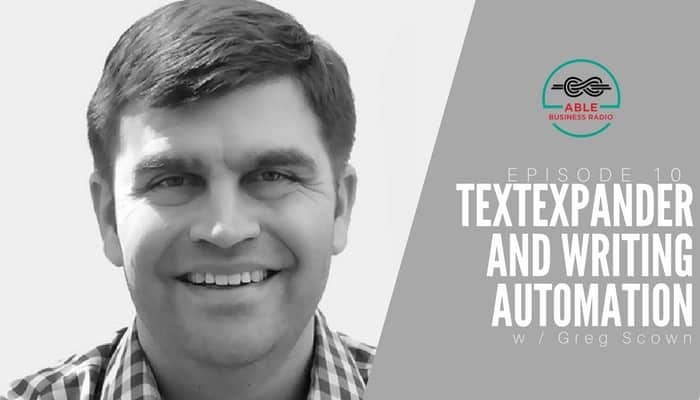 Greg came on Able Business Radio to talk about Smile’s popular writing automation tool TextExpander. and more into a knowledge base. I then pull on that knowledge base by typing in keyboard shortcuts (that I create). What TextExpander is and how to get started. How to take advantage of thinking you’ve already done. How to iterate and create amazing, repeatable customer support responses. The difference between the standalone app and the subscription service. How to keep your TextExpander snippets up to date. Buy TextExpander Full Disclosure: I earn a commission if you click this link and make a purchase, at no additional cost to you.